With the closure of Kuroko no Basket I thought I would do a review on one of the most popular anime out there. The genre of sports in anime seems to be the least popular among all the other genres. 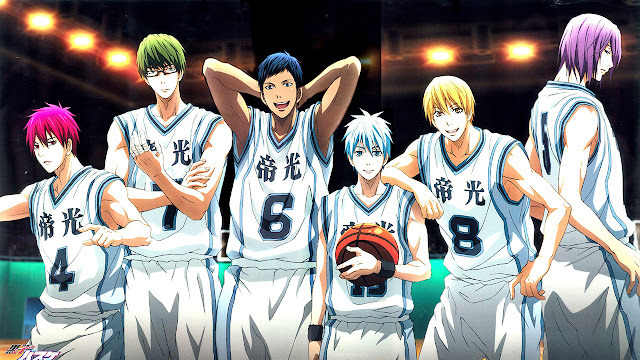 With the widespread popularity of Kuroko no Basket, the entire franchise is able to breathe new life into a genre that’s often overshadowed by other dominating genres in anime. This is a review for all three seasons since the anime is one continuous story chopped up into three seasons, no point in writing three separate reviews. The story of Kuroko no Basket is one that follows many of its predecessors in the genre of sports, and that’s the story about winning a sports alongside teammates who share the same passion as you. So bland that you might pass up on this anime but Kuroko no Basket is able to add an interesting twist to the series that makes watching the basketball games in KnB so electrifying. A group of five called the Generation of Miracles is formed at Teiko middle school, they all possess a unique ability, that’s literally humanly impossible, where they utilize at their disposal during basketball games. By having these skills, the Generation of Miracles has never lost a game when together. Because they have never lost a game, this shapes their views for game of basketball in a negative light. By the time the five have graduated they unnoticeably separate into different high schools and made a pack to see which one of the five in the Generation of Miracles is the strongest by facing at high school tournaments. Kuroko Tetsuya is dubbed as the 6th and unaccredited member of the Generation of Miracles, and is determined to prove that his “way” of basketball is superior over his other generation of miracle counterparts. I would like the praise the animation and music throughout the run of this franchise. The character designs were aesthetically pleasing and was one of the factors that ruled me in to watch. The animation was something to take note of since it's very fluid during the tense and fast paced moments during the games on court, this happens to be consistent throughout the three seasons. During the riveting moments of games against teams that have a generation of miracles player: the animation was again very fluid, the cool dunks, the flashy passes, all the standard gameplay you would normally see in a regular basketball game are animated quite nicely. I love how whenever things are about to get serious in the anime the character OST pertaining to whomever is played, and you know when that happens it’s about to go down (I’m alluding to Akashi’s awesome theme)! Now what’s special about Kuroko no Basket is its plethora of characters, and the ability they have to gravitate towards everyone. Due to the powers of the Generation of Miracles, and their colourful character designs, it’s difficult to pinpoint which of the five can be your favourite. On top of that they all have distinguishing personalities, so when they clash against each other it's quite funny at times to watch. Unfortunately I’ll be talking about only two people in this review one being the main character, Tetsuya and the other being Midorima of the Generation of Miracles. And no I will not be talking about Kagami in this review, yes he’s important but he shares the same ideals as Tetsuya, so I think it’s a bit redundant to cover him. So first up is Kuroko Tetsuya, he’s part of Seiren’s basketball team. He’s credited as the phantom sixth member of the generation of miracles and is known on the court for his assistive skills during games, and his lack of presence among others. Meaning his skills in passing the ball to other team members is unparalleled to others and he tends to not be noticed when around people. Unlike the rest of the Generation of Miracles, Kuroko belives that the key to winning in basketball is all about teamwork and he is determined to prove to everyone that is the proper way to win any game. Really like this guy, in my opinion he’s a realist and has the common sense chip ingrained with him compared to the other guys of the generation of miracles. During his time as part of the Generation of Miracles, he found that his teammates have lost the passion for basketball and have nothing in mind besides winning at any cost. Fortunately for him he’s able to remain true to himself and not subdue himself to the negative ways of his former teammates. He’s a bit of an introvert and because of that there are scenes during the anime where his introverted self comes of as hilarious, like his bedhead moment along side Kagami! The second is one of the members of the Generation of Miracles, and that’s Midorima Shintarou. He’s known to be a hard head, and the least tolerable when it comes to dealing with the shenanigans of his counterparts of the Generation of Miracles. His unique ability is landing 3-pointers at any distance on the court, even when he’s a few feet away from his own net (so unrealistic that it makes it so good to watch). And like the other Generation of Miracles, he is devoted to win any game at any cost, even if it means disregarding his others on his team. Overall I would like to wrap this review about talking about the level of enjoyment I had watching this anime. I just finished watching the last episode and I was extremely satisfied with the way it was concluded. During the last episode I was happy/excited to see the outcome of the last game/conclusion of the series but sad at the same time since I would probably never get to see an anime like this every again in a long time. Yes, shooting 3-pointers from the opposite end of the court is unrealistic, and that’s just one of the Generation of Miracles, you would be surprised to what the others can do haha. But it’s the same fact that makes watching the games in Kuroko no Basket so entertaining to watch. On top of that the comedy is great from Kuroko’s lack of presence and his ability to popup and startle others to the chemistry between the Generation of Miracles and the people on Seiren’s basketball team. I think about it as Goku versus Naruto when teams with a Generation of Miracle play against each other, the gameplay is so exciting; it looks like a game in Kuroko no Basket feels like a battle to the death but with basketball. All the key players and the Generation of Miracles have special names for the moves they do, much like Naruto and Goku with their names for their attacks; which makes it more enticing to watch to see which moves are going to be used at what time. And who doesn't want to see OP people fighting against OP people on court? To say the least I enjoyed the whole 75 episodes every bit. Anyways, this review went on way too long and I would like to cut it off here. If you made it this far into the review, thanks for reading. If you have any comments on the Kuroko no Basket Franchise or want to critique me, please comment down below. Thanks again for reading.